KTM 125 Duke Specification - KTM 125 Duke ABS looks really appealing by its alloy wheels, LED indicators , sporty body works and stylish graphics on it. The bike looks really larger than actually it is. The stunning looks, easy handling, good brakes and multi info display are the strong points of this bike. The 125 Duke has everything that distinguishes a genuine KTM - from the high-quality chassis components to the multi-function cockpit, which even keeps you up to date with fuel consumption and remaining range. The extensive KTM PowerParts range gives you the option of adding your own individual style. 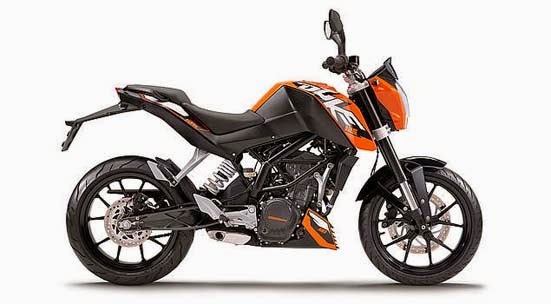 Equally lightweight and delicate as they are stable, the 17 in cast light alloy wheels developed by KTM specifically for the 125 Duke provide a 110 mm tyre width at the front and an impressive 150 mm at the rear. The tyres impress with tremendous grip in both wet and dry conditions, as well as providing supreme durability. The shapely 11 l fuel tank of the 125 Duke not only provides the rider with perfect knee contact, but also with a range of substantially more than 300 km even when ridden on the edge, thanks to the economic engine. The compact, three-chamber silencer is positioned close to the machine's overall centre of gravity. This aids centralisation of masses and improves the playful handling of the 125 Duke. Thanks to a regulated catalytic converter, the emissions are exemplary. The state-of-the-art, liquid-cooled, single-cylinder four-stroke engine with twin overhead camshafts, four valves and electronic fuel injection has been developed specifically for the 125 Duke. It effortlessly achieves its peak power of 11 kW (15 hp) and thanks to the balancer shaft, delivers the highest levels of smoothness. Just as on the RC8 R, the four valves in the cylinder head of the 125 Duke 2013 are actuated by two overhead camshafts and cam levers. This design is not only extremely reliable, but also offers low friction thanks to the ultra-hard carbon coating of the cam levers - releasing even more power. The 125 Duke is also a genuine motorcycle in terms of dimensions, providing plenty of space and freedom of movement. The gathered sitting position supports relaxed touring equally as well as committed cornering. Large contact surfaces ensure optimum control and perfect feedback. 11 kW (15 hp) of power with an unladen weight of only 127 kg guarantee plenty of riding fun with the 125 Duke. The first-class chassis, with lightweight tubular space frame in the proven KTM design, turns it into a real surfer through the bends. Weight grouped close to the centre of gravity maximise manoeuvrability and precision. The 125 Duke's high-quality upside-down fork from WP Suspension has the same 43 mm outer tube diameter as the RC8 R – in other words, real racing equipment that guarantees highest levels of stability and precision. The 125 Duke's lightweight, high-quality, pin-jointed swingarm is designed and produced according to the same principle as the 690 Duke. The light alloy swingarm with directly linked WP shock absorber excels with extreme torsional stiffness and outstanding tracking stability.